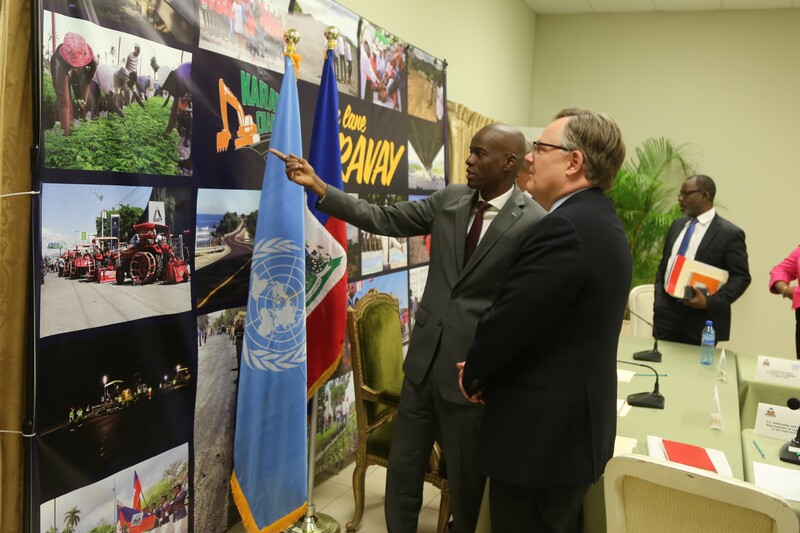 In a meeting with President Jovenel Moïse today, a delegation of the United Nations Economic and Social Council Ad Hoc Advisory Group on Haiti (ECOSOC-AHAG) discussed the socio-economic situation in the country and inquired about long-term priorities for the development of Haiti. “Political stability, the fight against corruption, strengthening of the rule of law and technical partners alignment are essential to foster productive investments, peace and sustainable development in the country,” stated President Moïse. “The rule of law is essential for a Haitian-led economic development,” said H.E. Mr. Marc-André Blanchard, Chair of the ECOSOC Ad Hoc Advisory Group on Haiti, Ambassador and Permanent Representative of Canada to the United Nations, who heads the delegation. “To achieve the country’s ambitions, the international community must continue its steadfast support to national priorities,” Mr. Blanchard added, highlighting the importance of coordinated action among all development partners for maximum effectiveness. The delegation is composed of 17 member states at the Ambassadorial level: Canada (Chair), Argentina, Bahamas, Belize, Benin, Brazil, Chile, Colombia, El Salvador, France, Haiti, Mexico, Peru, Spain, Trinidad and Tobago, Uruguay, and the United States of America in addition to the Czech Republic as an ex oficio member as the President of ECOSOC. During its visit to the country, the Group will meet with Haitian authorities, including Judiciary senior officials, parliamentarians, local authorities, civil society representatives, the United Nations country team and the United Nations Mission for Justice Support in Haiti (MINUJUSTH), as well as private sector leaders to discuss progress and challenges in achieving sustainable development. The Ad Hoc Advisory Group will submit to ECOSOC a report on its work, with recommendations, at its Coordination and Management Meeting in July 2018. For more information, please visit the ECOSOC- AHAG website.